The purpose of the National Community Energy Strategy is to develop a shared agenda – vision, set of objectives and priority initiatives – to grow a vibrant community energy sector across Australia. To ensure that this is truly a shared agenda, a highly collaborative process has been undertaken to build and secure commitment from all key actors in the emerging community energy sector. Community Energy is the term used to describe the wide range of ways that communities can develop, deliver and benefit from sustainable energy. It can involve supply-side projects such as renewable energy installations, and storage, and demand-side projects such as community education, energy efficiency and demand management. Community energy can even include community-based approaches to selling or distributing energy. Community energy projects encompass a range of technologies and activities across a breadth of scales, determined by the community needs, availability of local natural resources, technologies and funding, and community support. 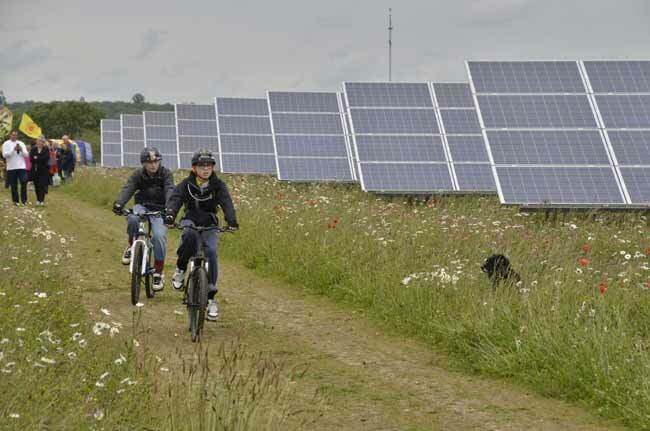 Community energy projects are social or community enterprises, driven by local people. That is, community energy groups tend to have a social and environmental driver, as well as an economic one. While communities of place are emphasised in referring to ‘local’ communities, communities of interest are also relevant – such as the Coalition for Community Energy (C4CE) or the recently formed faith-based National Energy Efficiency Network (NEEN). Demonstrate that clean energy technologies work and that a clean, low carbon energy future is possible. Over the past decade the renewable energy industry in Australia has expanded significantly. This follows widespread agreement that the combined threats of climate change, pollution and resource depletion require a comprehensive response, including the reduction of greenhouse gas emissions from energy generation. Government policies supporting sustainable energy have been variable and typically hinged on a patchwork of certificate trading schemes. This approach represents a marked departure from the systemic, and increasingly consolidated, planning, training, construction and operation of electricity generation infrastructure during much of the twentieth century2. While the policy environment has fluctuated, opinion polls have consistently found widespread public support for sustainable energy. Most strikingly, this support seems to cut across the political spectrum. For example, a recent Essential Communications poll 3 found significant support amongst Labor, Greens and Liberal voters for maintaining a strong renewable energy target. However, this has often failed to translate into a consistent policy and regulatory environment to support the potential of this sector domestically, and to position Australia as a leader in sustainable energy within the global community. Community energy provides access to, involvement in, and ownership of energy systems – which have traditionally been in the realm of government and large private organisations – to ensure the benefits are more evenly and equitably distributed. Through their grounding in community engagement and ownership, community energy projects educate and involve the broader public in the development and delivery of renewable and other sustainable energy approaches. Community energy secures a ‘social license to operate’ for energy projects in both the planning and operation stages. Community-owned energy projects tend to experience stronger support, and illicit less opposition and concern, than commercially owned ones 4. The community and social focus of community energy can be appealing to decision-makers that may be divided on other aspects of sustainable energy. The Collective Impact Assessment undertaken through this project found that the 27 participating community energy groups have a combined membership and supporter reach of over 21,000 people (see Appendix C). Furthermore, community energy projects are well placed to fill a scale gap between large utility scale renewable energy projects (10-2000 MW) and household renewable energy (1-10 kW). Through a portfolio approach to energy planning it is recognised that a variety of forms of energy generation will be required to build a resilient, reliable and low carbon electricity grid. With community generation projects tending to range in size from 10kW to 10MW, filling this scale gap provides new opportunities to scale up the sector. Creating a community-led response to managing electricity price rises. The community energy sector in Australia has grown from not much more than an abstract concept in 2006, to a point where by early 2015 there are at least 19 community energy projects operating 6 and at least 59 community energy groups developing, delivering and/or operating projects 7. A number of donation funded community solar projects on community buildings in Victoria, NSW and South Australia 8. A baseline survey conducted as part of this project (see Appendix C) shows the significant environmental, economic and social benefits already accruing to Australian communities from community energy projects. With almost 10 MW of installed renewable energy systems as at the end of 2014, the sector is delivering over 50,000 MWh of clean energy each year, and avoiding over 43,000 tonnes of carbon emissions. In addition, there are a range of supporting organisations providing services to and advocating for community energy at a state and national scale. Through this process, these organisations have formed the Coalition for Community Energy (C4CE) – an innovative and collaborative approach to governance to enable greater collective impact across the growing community energy sector through joint priority initiatives. C4CE anticipates that with policy support the Australian community energy sector could follow in the footsteps of the Scottish community energy sector, which grew to over 300 operating community renewable energy projects in a decade 9. The National Community Energy Strategy project commenced in December 2013, funded by the Australian Renewable Energy Agency (ARENA) and led by the Institute for Sustainable Futures (ISF) at the University of Technology Sydney. The Strategy team comprises the following founding organisations of C4CE: Starfish Initiatives, Embark, the Alternative Technology Association, the Total Environment Centre, Community Power Agency, Backroad Connections, Sustainable Regional Australia and the NSW Office of Environment and Heritage. In July 2014, a contract variation for the project was confirmed and the project team expanded to include ClearSky Solar Investments, the Between Social Movements and Social Enterprises Research Program at UNSW, RePower Shoalhaven and the Moreland Energy Foundation. What will it take to get the current wave of community energy projects in development to a point that they are operating? What will it take to replicate the successful models of community energy in communities across Australia? Community energy models: clarifying and documenting standardised “models” of community energy, which form the basic components of a project that can be utilised by or adapted by new communities across Australia. Funding and Financing: identifying the funding and finance needs of community energy projects and the wider community energy sector. Capacity Building: building the capacity of community energy proponents to successfully implement and deliver their projects. Policy and Regulatory Reform: articulating the range of government interventions and support programs required to realise the vision for a vibrant community energy sector. C4CE partner organisations undertook targeted research to inform the development of the above five sub-strategy areas. This included the development of a national survey of 38 community energy projects across the country, and a series of interviews with key stakeholders to identify objectives and priority initiatives. The results of this research was then synthesised into a working draft of the Strategy. At the Congress, the Draft Strategy was presented to and input sought from approximately 180 community energy stakeholders in a half-day session at Old Parliament House. At this session, participants were invited to develop and share their vision for a community energy sector, identify a series of questions that a comprehensive National Strategy should answer and start to develop the most pertinent Priority initiatives to grow the sector. Based on the input from participants at the Community Energy Congress, the Strategy was revised, expanded and refined into a first formal draft. undertake analysis of the costs and cost reduction potential of six community energy models (Appendix F) to increase understanding of the range of existing models, as well as underpin the finance and funding sub-strategy. The National Community Energy Strategy has been revised and finalised in March 2015 to reflect the new work in Task 6. Under the guidance of the Coalition for Community Energy (C4CE), the National Community Energy Strategy will be updated periodically to reflect evolving sector needs. Section 1 provides an introduction and overview of the National Community Energy Strategy project. Section 2 is a high-level summary of the National Strategy, outlining a vision for the community energy sector and objectives and priority initiatives within each of the five key areas. Sections 4-8 are detailed sub-strategies for each of the five key areas: Facilitating Community Energy Models, Funding and Financing, Capacity Building, Building Support for Community Energy and Policy and Regulatory Reform. Section 9 outlines the proposed processes for delivering the National Community Energy Strategy and tracking progress towards the vision and objectives identified through a shared monitoring and evaluation framework. Section 10 is a list of supporting documents and appendices that have been developed through the National Community Energy Strategy. Some of these documents are finalised and publicly accessible, others are working documents that have been made available to working groups looking to progress areas of the National Community Energy Strategy. 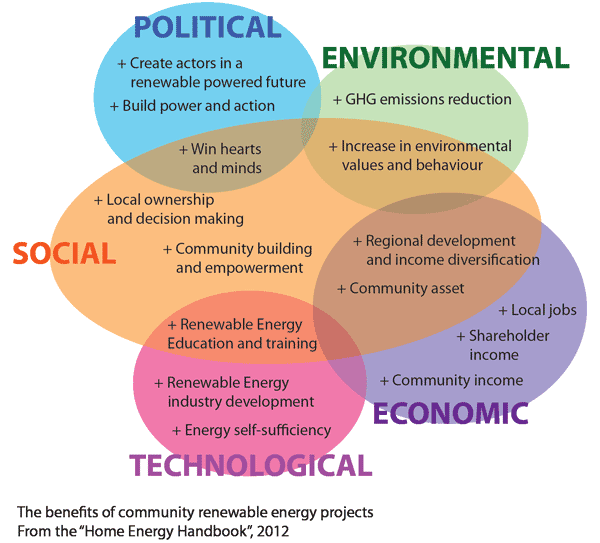 Taken from Ison, N & Hicks, J (2012) ‘What is Community Energy’ in Shepherd, Allen and Harper, Home Energy Handbook. Centre for Appropriate Technology, Wales. Wilkenfeld, G. & Spearitt, P. 2004. Electrifying Sydney: 100 years of Energy Australia, Sydney Energy Australia. Based on research suggesting that the receipt of economic benefits from wind farms reduces the significantly decreased risk of community annoyance. See Pedersen, E., et al., Response to noise from wind farms in The Netherlands. J Accoust Soc Am 2009. 126(634-43). Adam Blakester is also a key contributing member of the C4CE and a co-author of this strategy. It should be noted that the operating projects counted are mostly community renewable electricity generation projects, particularly solar PV and wind as these are the ones most known to the authors and the ones assessed through the Collective Impact baseline assessment (Appendix C), rather than demand-side community energy projects. Further, this figure of 19 projects aggregates community energy projects where a number of small systems have been installed and excludes community solar bulk-buy programs. A full list of community energy groups and associated projects is provided in Appendix A and they are mapped at http://energyarchipelago.com/#/map. Detailed case studies can be found on the Embark Wiki (www.embark.com.au) and guides for setting up behind-the-meter community solar projects such as the REPower Shoalhaven and Clearsky models can be found in Appendix E.